We are excited to share a brief overview of our Hackathon agenda! Please be advised that emails to all confirmed and registered participants were sent out yesterday. Everyone who applied should have gotten an email from us. If you have not heard anything, please contact emily@femaletechleaders.org. 24 hours of hacking is just around the corner! If you have any questions, feel free to drop us an email! We are so excited to hack with you! We are inviting hackers to join FTL and Social Sweethearts this March 2 and 3 for a frenzied 24 hours of designing, coding and making. You'll have the opportunity to bring together all sorts of data and information using any and all tools the web has to offer in our “Social Infotainment Hackathon”. With the goal of creating a memorable user experience in the context of infotainment, this hackathon aims at bringing together 30 creative minds to build exciting visualizations and apps, using your favourite APIs. Infotainment provides stories to the people with personalisation and emotionalism. It tries to search for thrilling, special and surprising essence of an event and makes an entertaining, exciting story out of it. 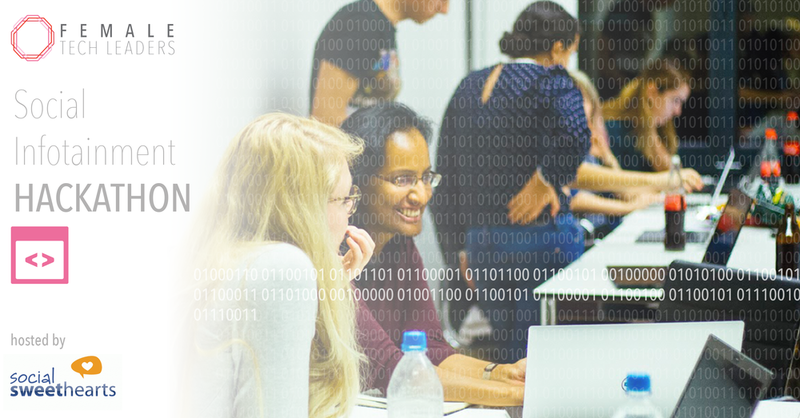 If you are male or female familiar with web services, data science and APIs, apply today to be a participant on March 2 and 3 with celebration to follow! Deadline for application is Saturday, February 24th, 2018. Prizes will be awarded and at the end of the 24 hours where teams present their work to the judges.